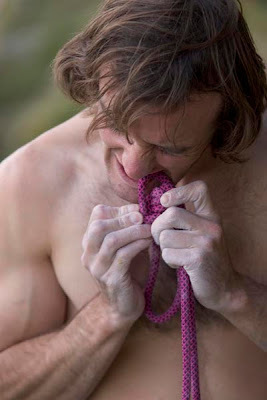 Hot Aches Productions: MacLeod wins Golden Piton for Traditional Rock Climbing. MacLeod wins Golden Piton for Traditional Rock Climbing. 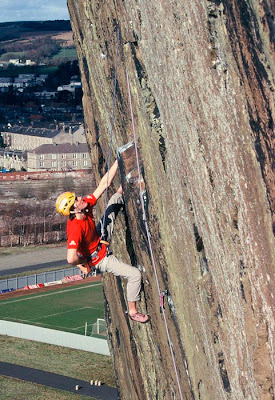 Climbing Magazine (USA) has named Dave MacLeod as the recipient of their prestigious annual Golden Piton Award for what they describe as “probably the hardest trad lead” on Rhapsody, E11 7a. So huge congratulations to Dave. At Hot Aches we are obviously well acquainted with that route and very pleased that we could capture the whole process on film. The award is particularly pleasing because, in this slightly mixed up world of climbing, we, as film-makers, have won several awards for E11 but until now the most important person – the climber, received nothing. Dave releasing his emotions after succeeding on Rhapsody. Screen grab from the film E11. It was also a year in which there was certainly very strong competition for the award. Sonnie Trotter’s ascent of the striking Cobra Crack at Squamish was doubtless a strong contender. Not since the release of Hard Grit a decade ago has anything put British climbing so much under the international spotlight. The increment of a clear grade is a rare occurrence in trad climbing; roughly once a decade. It will be an interesting year ahead with several other climbers eyeing up hard new routes (James Pearson already putting up the hardest route on grit) or setting their sights on significant repeats. Some strong overseas climbers should be heading to our shores too. Perhaps Rhapsody will even see a repeat and perhaps Dave MacLeod will succeed on his Ben Nevis super-route? Certainly the Hot Aches team are going to be busy capturing as much of the action as possible for their new film release “Committed” in October of this year. A direct finish to Dave Cuthberton's Requiem ( a heady E8 6b), Rhapsody features a 14-move V11 crux ending 30 feet above a micro wire, making for heart-stopping, 60-plus-foot whippers on a route 70 feet total in length. It is the only E11 on Earth. Historically, high end E-routes are headpointed only after extensive toprope rehearsal such that a fall is virtually eliminated. while falls have been taken on E10, the most catastrophic whippers on top-shelf E routes remained in the realm of pure speculation. MacLeod on the other hand, took the gigantic crux whipper numerous times, resulting in sprained ankles, twisted knees and countless cuts and bruises that left him hobbled home both physically and mentally. Hats off for the ascent and for stepping into a new category." says Kevin Thaw, fellow UK climber, who adds that MacLeod's merging of trad tactics to a hard-5.14 face climb represents a huge cognitive leap. "E11 is a big fat number, certainly weighted toward being the stoutest gear route around!". 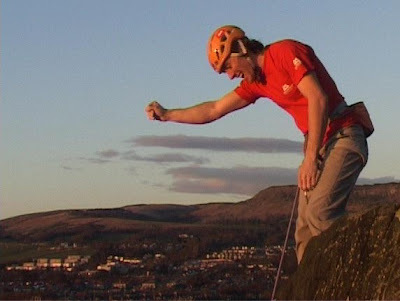 MacLeod's ascent, after 70-plus days of effort, became the focus of a UK movie, E11, which showcases the first ascent as well as several jaw-dropping falls onto the micro wire. 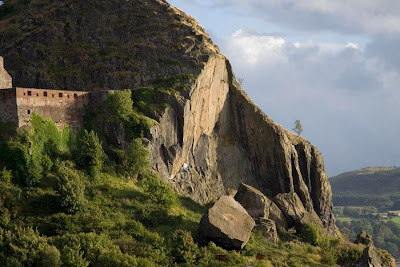 In one of the first falls MacLeod takes in the film, the rope catches his leg and flips him upside down - he likely would have emptied the contents of his skull on the weathered basalt belay ledge below had the gear pulled, which, on a later fall, it did. "Most of the time I was falling off and stopping just above the belay ledge" says MacLeod. "One time the micro wire snapped, and I bounced off the belay ledge on the rope stretch". A few falls like that later and he decided to wear a helmet. "Style matter." says the Yosemite local Cedar Wright. "and that's why ascents like Rhapsody are a total inspiration. MacLeod climbed the line on its own terms, in spite of the real possibility that his obsession was going to land him in the emergency room." Something not quite right there, the climber received nothing? They should have received 'everything' not least for their determination and their efforts.